Fellow-travelers, behold the lovely roses in this photo, which I took at the Albuquerque Rose Garden last May. The Rose represents our central challenge as we move into this new Cycle: allow the perfection to unfold naturally. I'll explain more in a bit. We're just a few days past that extraordinary full moon, and I have a new CycleCast to describe the nature of the energy blast we're getting from it. The high we get from this Cycle will last through July 28, so use the coming week to begin practicing the accentuate the positive theme that will carry us through the summer and into the fall. We are literally changing the relationship of our human species with Gaia, the earth - and Gaia is more than the earth; she is the living eco-being made up of earth, wind, water, stars, and all creatures who live on this globe. It seems every level has been part of a community since the beginning - except for us. Humanity as a whole has held out, choosing separation under the delusion that we are somehow "special." Except for some us, like me and you, fellow-travelers, who have long recognized - and yearned for - our connection with the whole. Now our species is waking up, and I think many of us on the path are feeling downright giddy to sense this wave of evolve-ment taking place. Finally, it's beginning. What do the cards say? First, there's a lot going on; all of the energy levels are represented in this reading. We wind up some old cycles with a sense of fulfillment, and immediately start over again. Much of it involves circumstances beyond our control, as well as destiny. And running through it all is a thread of: What will I be when I grow up? We're ready to put down Roots, fellow-travelers, for we realize how we've looked at Gaia herself as the Wanderer, always elusive and out of reach. The Impulse to bring forth the Enlightening truth comes like a bolt out of the blue. Way way back, we struggled under that Cross we thought we had to carry. Magicians tried to manipulate their way to heaven. Now the Rain has come and drenched the fires of cunning, the hubris which has driven us to tear up our poor planet so we could live as we thought kings should. Grieve for the creatures who have lost their lives so we could carry our groceries home in plastic bags. Take a break, start fresh, and then pick up the Wand once more - wielding it this time with the empowered will that is aligned with the harmony of the universe. Look ahead to be the Child playing in the Rose garden. Want perfection? Prepare the ground, plant the seed, water and feed it. That's all you have to do; the lovely Rose will bloom on its own. And hidden somewhere in this garden is the Key, the one that opens the Chest filled with treasure. We'll know the next right thing do when the time comes to do it. Don't plant your feet, traveler; instead keep a shifting footing because the Sand is always subject to change. Run free with joy; this Fountain is bubbling over. Then use the Ice to cool down and see clearly the next step on the path. Some of us will keep on Reaching for our stars; and if you really want to take on the challenges of this time, you can grind yourself down into a fine golden Powder and re-create anew. It's all good. Did You See that Full Moon Last Night? This month's full moon happened officially at 1:59 am in my Mountain time zone, so the time to see - and feel it - was last night. About 9:15 pm, I saw the moon glowing through the clouds and tree branches in my back yard. Feeling pulled by the great positive energy coming from this moon, I went outside to receive, and welcome, its grace. I literally opened my arms to the moon's light, and said, "Bring it in, bring it on..." Not very elegant for a ritual, I admit, but simplicity and sincerity - they work. And since my neighbors already know I'm weird, there's nothing to worry about in that department. After receiving a generous dose of the moon's light, and being called to return to the usual household hubbub, I went back inside. A few minutes later, the clouds closed in and it rained cats and dogs for a good while. The monsoon season is full swing in New Mexico right now, and it's been a soggy week or two. Grace: that is the theme of this time. Despite the tremendous challenges we are facing now on our planet, universal light and grace are coming in by the bucketloads. Many spiritual teachers, visionaries, and mystics are noting this. The link below shows one wise teacher's explanation, and it rings true for me. I have been feeling it myself, and I've started preparing a new CycleCast to further understand the significance of this particular full moon energy. It will take a day or two to get it posted, so come back soon. But I'll give you a hint: We are entering the Sea of Birth, which brings forth new things. Look toward the East, where the new dawn brings opportunity. 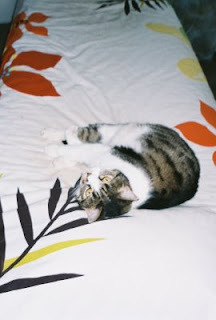 Today is a very special day: my cat Luvlee is nine years young today! At least, we think so - it's the birthday shown on her adoption papers, and therefore represents the best guess we limited humans can make make about the day this sweet being came into the world. So, Luvlee had a fine day of: napping, sitting in the sun watching birds, sleeping, getting brushed by Mom, snoozing, getting treats to eat (including turkey when Mom opened a package of lunch meat - yum! ), chasing string, dozing, and just generally having a lovely day at being a Luvlee cat. Life wasn't always this nice for Luvlee. Something really bad happened to her when she just a little cat. There are old injuries evident in her lower back, left hip, and left knee. We don't know exactly what happened, but we can guess that some human wasn't nice to Luvlee. Fortunately, the injuries don't slow her down, for although she often limps, Luvlee can run and jump with the best of them. When it comes to pouncing on things, Luvlee is an Ace Chaser! It's hard for me to believe that it was five years (seems like a week) ago when Luvlee came into my life, as a foster cat from the Albuquerque Cat Action Team. The wonderful folks of ACAT are dedicated to making life better for cats and their humans. They ensure that all cats and kittens who come into their care are adopted or fostered into safe, loving homes. I signed up to be a foster mom when I was "between cats," and not sure if I wanted a full-time kitty. Well, Luvlee took care of that decision for me. I believe we bonded, Luvlee and I, before we even met. I know that I felt the connection when I was first told about her. Thank goodness Luvlee was rescued from the bad situation that caused her injuries. She was adopted by an ACAT family before me, living three happy years with them. But then they had to move, and could not take her, so she went back to ACAT. This transition was tough on her. By the time she finally came to my home, Luvlee was not a happy camper. No, sir! But she quickly settled in. I made a point of giving her Jin Shin Jyutsu energy, at first to help her calm down and feel secure in her new home, and then to help ease the residue of the old injuries. Now her bedtime ritual is to climb on my lap for her daily dose of petting, ear rubbing, and - only if she thinks she needs it - Jin Shin Jyutsu. After a little energy balancing, she hops off my lap and heads over to her food dish, happily munching away at the food she had turned up her nose to all day. Yeah, Jin Shin Jyutsu is good for balancing the appetite. Owners of food-finicky cats, take note. So, as this Luvlee day ends (with a peaceful snooze right now - but there will be more string-chasing later on, mark my words), I just want to say Thank You to the Universe, the gods of Kat Karma, and whatever good fortune was guiding us both, for bringing this furry bundle of love into my life. 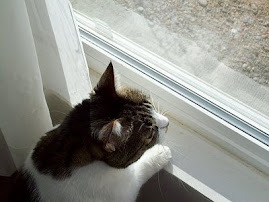 Happy birthday, Luvlee, and may you have many more years of sunny birdwatching. This is Jin Shin Jyutsu: lots of smiling, happy people spread around the room, giving the touch of healing, and practicing Mary Burmeister's admonition to Be the Smile. This photo was taken at one of the seminars I was in while training to be a practitioner. You've heard the saying, "In every ordinary day, there are miracles." I know the inherent truth of this wisdom, but most of the time I forget this until an ordinary-day miracle hits me smack in the face. Then I get conscious enough again to be grateful, and if I'm really sharp, I remember to share the experience, strength, and hope of the story with others. Like I'm doing right now, dear readers. The fact that this series of miracles centers around my favorite, most beloved practice of Jin Shin Jyutsu makes it even better. I've promised for some time to give you, dear readers and fellow-travelers, a look into my passion for this art, but my highly-refined talent for procrastination gets in the way. Well, now's the time to start the series. Look for more posts to come; they'll be labeled Jin Shin Jyutsu miracles. Today was a fairly ordinary Saturday: up late as usual; frantic dash to tidy up the house; off to pick up a friend and go to a meeting; then dash back home to see a new client for her first Jin Shin Jyutsu session. Then came Miracle No. 1: The referral for this dear lady who lives about a mile from me in beautiful Albuquerque came from Singapore! That, of course, is also a miracle of the Internet: my client's niece, who lives in Singapore, has been receiving Jin Shin Jyutsu sessions for herself and daughters. The niece found me through the Jin Shin Jyutsu website, told her aunt about me, and we got together. Sounds so simple, doesn't it? It's only the other side of the globe! My client arrived with her daughter, who wanted to observe the session. Well, there's not much to see, as Jin Shin Jyutsu is a quiet art, and although I do tend to rock back and forth while giving the session, that gets old after a while. Miracle No. 2: I had just picked up a supply of the July issue of New Mexico Woman magazine, for which I've been writing a column on alternative health matters. My column this month is about ... guess what ... a simple self-help exercise from Jin shin Jyutsu that will help anyone gain an overall, harmonizing energy boost. Now the daughter had something to look at besides me rocking my way through the session, and the two were able to take magazine home to practice their own self-help. Here's the self-help: hold your fingers! One a time, comfortably wrap the thumb and fingers of one hand around the thumb, then index, then middle, ring, and little fingers of the other hand. That's all there is to it. Then came Miracle No. 3, at the end of the session, when my client told us how good, and relaxed, she felt. Of course, it wasn't news to me - I had felt her energy shifting and responding to the work - but I am always happy and grateful when a client notices the shift right away. It is a subtle art, so sometimes it takes a while for the harmony to become noticeable. Now I am excited to be with this new person as she begins her journey to toward wholeness, and well-being. Now that I've told you about the miracles, I should tell you that Jin Shin Jyutsu is an energy-balance method used by thousands world-wide to maintain and enhance their well-being. I am passionate about it because Jin Shin Jyutsu gave me my life back, after many years of struggling with chronic and debilitating conditions. For more information about my professional practice, visit my Geo-Glow Consulting website. Mary Burmeister (1918-2008), the founder of Jin Shin Jyutsu in the West, said: By revitalizing one's energy, all disharmony, fears, and attitudes disappear. The rhythm with the universal energy within and without takes place. In this state of harmony there is no imperfection. Having experienced this state, I believe it. In a future post, I will tell you about my one meeting and chance to work with Mary. In the meantime, be the smile! Mea culpa, fellow-travelers, I've left you without a CycleCast since the last one ended on July 7. It's my bad, I know, but I trust we are doing fine with the energies of putting-to-work-our-lessons-learned that came with the last cycle. And by the way, did everyone have a happy, safe, and sane Fourth of July weekend? I hope so. The theme of this CycleCast is Building Blocks and Leaves. That's why I've included this picture of the labyrinth - it has lots of green leaves, a block-shaped center stone, and the formation itself represents foundation. Yes, foundation - that's what we're moving towards in this Cycle, even though some challenges await us on the path. We swim into this Cycle with the grace of the Swan, fellow-travelers, and continue to Wander forward along our path. There's been a turning point, something has died to make way for rebirth; we must seal the Coffin before the new energy can be born. Ahead of us, the Star of Aspiration beckons us to move beyond our limitations, reaching for the stars. But what's that Block doing here again? Don't stumble over it, traveler; instead, put your gardening skills into play. Yes, this Block is a foundation for new energy to emerge; add some compost and watch that fresh, new Leaf sprout forth. Right now, the question is: which face do you wear, the one of tragedy or of comedy? We're all Laughing at the whole comic opera in which we find ourselves. But remember the challenge of the Mask: that which is hidden must sooner or later be revealed. It helps to prepare the soil and make sure your Roots are firmly planted, for how else can that green emergence take place? Don't get lost in the Fog; shine a light to see the way clearly - but remember that if the Fog does roll in, just sit still for a while - it will always lift in its own time. How can we resolve the challenges we face in this Cycle? We may be called to make or renew a commitment. This is a good thing; remember, the Chain can link, not just bind. Overcoming limits and dealing with authority is part of the practice of this Cycle. It takes a little bit of Patience, but when you hear the Thunder calling you'll know it's time to make up your mind and go for it. Fly straight like the Arrow to your next goal. Or, if the sky is quiet, just float like the Swan across the Pool of reflection and tranquility. This CycleCast is in effect now through July 24; the energies peak with the moon in Capricorn on July 15 through 17. 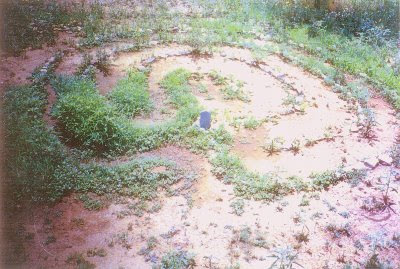 The photograph shows a labyrinth I constructed at a house I lived in during my Silver City, New Mexico, days of the mid-1990s. So you might say, I'm a natural-born patriot. However, I don't do the kind of pseudo-patriotism that involves waving flags, wearing lapel pins, and blowing things up to show how great we are. I do question the USA's actions, both at home and in the world at large, and while I never forget the great and wonderful things this country has done throughout its history, I also never cease to point out how much we need to do better. And it makes me really sad that I'm a rarity for doing this. In the primary election last month, my home county - Bernalillo County, New Mexico - experienced a record-high voter turn-out. That's great news, isn't it? But that record-high turn-out was only something like 28 percent of eligible voters! This is a trend that's common everywhere in U.S., to our great shame. 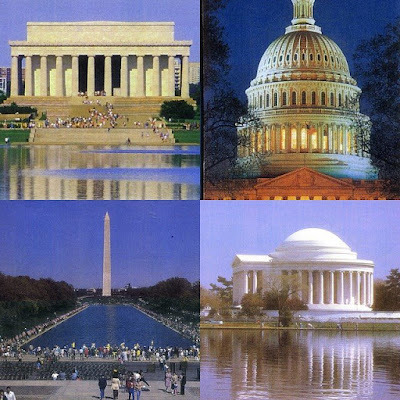 Have we Americans come to take our democracy for granted? In truth, I wish I didn't stand out for voting. I want to be just one of many of my fellow citizens who fully embrace their fundamental right - no, their fundamental duty - as citizens to do the one thing we can all do to make a difference: VOTE! "It's waste of time, nothing ever changes"
So let's dispense with the whiny excuses and get down to the core: "I don't know who to vote for." I must admit, as a natural-born political animal, this one puzzles me. Some of my friends think I absorb political info from the air, but in fact I glean my knowledge from all the avenues available to you. I read, I listen to interpretive news programs, I surf the Net. It's just about having the willingness and putting the focus into doing it. Therefore, as a service to you my fellow-travelers, I'm dedicating part of my blog this election to posting information sources for you political education and voting preparation. You will see these sources as links in sidebar, under the title Get Informed and Take Action! 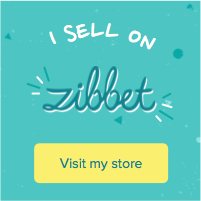 Just clink on a link and go to a site I have personally have visited and checked out for its user-friendliness as well as quality of information. Yes, most of these sites are from the progressive side of the political spectrum, because that is where my political passions lie and I'm going to be true to myself here. Fellow-travelers, don't tell me politics is boring, or too hard to understand, or you don't know where to get information. I've done everything I can to make it easy for you. Now, it's up to you to take up the challenge our Founders - and all the others who've gone before us - have given us, to be true citizens and participants in this great democracy of ours. Will you rise to the challenge, and VOTE? Happy Fourth of July. 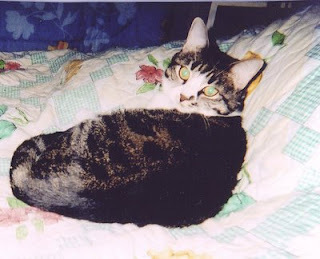 Be safe with fireworks, and read my cat Luvlee's post just after this one! Luvlee Says: Remember us on the Fourth of July! 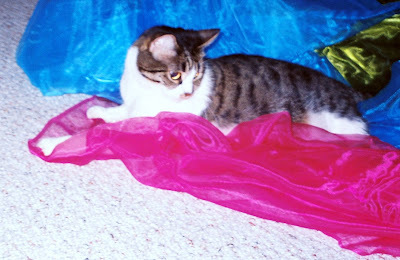 I, Luvlee Cat, was having great fun diving into this pile of material one day while my mom took pictures of me. In the photos, my beautiful white fur against the colorful fabric makes the red-white-and-blue colors of Fourth of July. So now I've got mom (her name is Jan, and sometimes I have to help her write this blog) posting this special message to remind all of you humans that, while it's fine to celebrate things, you gotta be careful of the critters, too. You see, people aren't really as bright as Cats, but we give them slack because they're only human. And for some strange reason that Cats have never been able to figure out, humans like to make a lot of noise that serves no purpose whatsoever (as opposed to Cat sounds which always have a deeply meaningful purpose, to Cats). And Fourth of July, with all those fireworks around, is a noisy time of year! Now this is probably okay for humans, who are really rather dense, but most critters, and we Cats especially, have very sensitive hearing. You don't need to blow things up to get our attention! Now, I'm a pretty Brave Cat, and very smart, too, so I would never do anything silly just because of a little noise. But some critters - and we all know Dogs are really, really stupid* so you know who I'm talking about - can get so scared from fireworks, they'll hurt themselves! That's right, every year around this time, my mom reads stories in the newspaper and tells me about them: About how critters run out in the street and get hit by cars, or strangle themselves to death trying to get out of a fence, or just get so nervous and upset they won't eat and then they become sick. It's true! This really upsets my Mom, because she's pretty sensitive (for a human), and besides she gets scared from those old fireworks, and I have to cuddle up and take care of her. When fireworks are going off, stay home with your critters if you can, so you can all keep each other safe and calm. If you can't stay, please make sure they're in a safe place where they can't get out into the wide world where no one is watching out for them. Play some soothing music to help calm things down. If you have a critter who's really, really sensitive, maybe a pet doctor can prescribe something to help calm the nerves. Please take care of your animal friends at times like Fourth of July. And when it's all over, maybe you could put out some seed and water to bring back the Birds? Your neighborhood Cats, and I, will thank you. *Ed. Note: This statement is solely the opinion of the author, Luvlee, and does not in any way reflect the policies or opinions of the management of this blog.